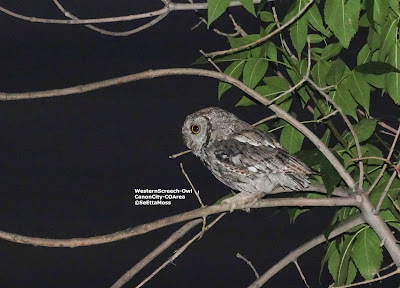 Last night I found a family of Western Screech-Owls but it was already dark and all I got were a couple of cellphone pics (pretty good for cellphone camera pics in the dark). Tonight I returned earlier so I could get a few photos at dusk when they came out and with my Sony hx-300 digital camera so photos better. The first photo is of an adult bird while the second and third are of a young bird that from it's flying ability was fairly recently fledged. I have seen a total of 3 of these cute little owls-one an adult, one a fledgling and haven't seen the third well enough to guess age. This would be a small family group with adult being a parent showing young how to hunt,etc. I have seen them hunting moths, a common target for these little guys. The eastern edge of the 8 Mile Fire is on steep mountain areas a few miles from several homes that were built in the forest-urban interface-the area that firefighters call the 'stupid zone' because it is at risk from the natural cycle of wildfires that has occurred long before man arrive. 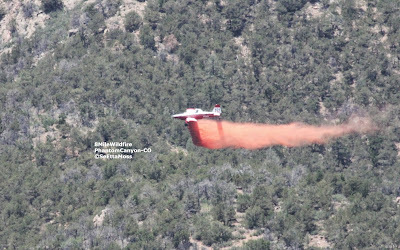 As useful as this fire retardant is in keeping the fire from spreading across where it has been dropped, it is an environmental pollutant that has killed fish and other species.